Looking to create change for yourself or your organization? Want to introduce new patterns of behavior within your team? Over the last 25 years I have held senior leadership positions, including being the global internal Executive Coach for a Fortune 50 company. I have coached more than 700 executives and clients in organizations, including University of Michigan, Ross School of Business, Amazon, and The Walt Disney Company. For the past 11+ years, I have partnered with talented leaders, executives, and organizations. Each client is unique in their objectives, skill sets, and motivation. 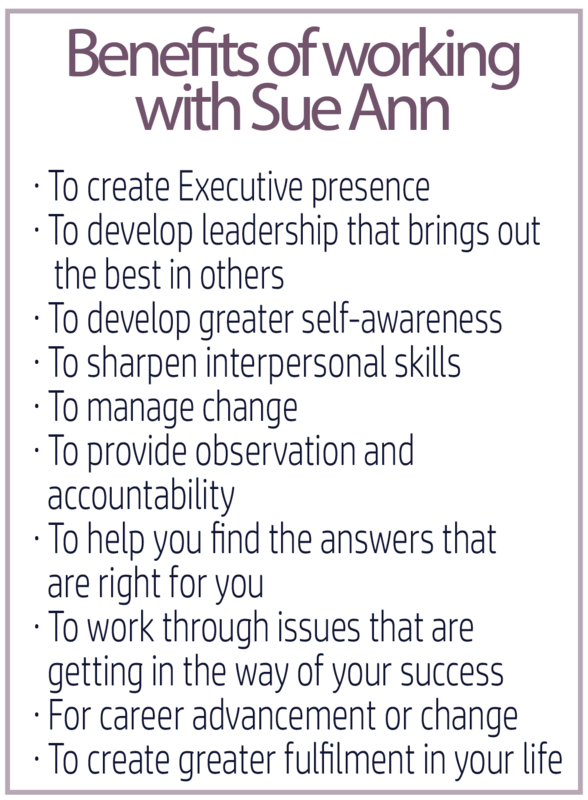 Using a coaching process based on numerous coaching certifications, positive psychology, and neuroscience, plus experience as a business leader, business owner, and years of education I have created a comprehensive program for my clients. I am looking forward to getting acquainted! Before we talk, I would like to find out more about you and your goals. Please complete the questions below so we can arrange our first call. Thank you for completing the form and telling me about your coaching goals. Powered by Squarespace © Copyright 2019 Sue Ann Gonis, All Rights Reserved.